But what was it? An oil slick? Some sort of immense, amorphous organism adrift in some of the planet's most remote waters? Maybe a worrisome sign of global climate change? Or, as folks who followed the blob via the Internet wondered, was it something insidious and perhaps even carnivorous like the man-eating jello from the old Steve McQueen movie that inspired the Alaska phenomenon's nickname? The hunters got word to the U.S. Coast Guard, which immediately sent two spill-response experts to fly over the mass, which looked sort of rusty from the air. The Coast Guard also approached it by boat. The North Slope Borough, the local government for the vast and sparsely populated cap of Alaska, sent its own people out of the main village of Barrow to have a look. They scooped up jars of the stuff for analysis in a state lab in Anchorage. "We responded as if it were an oil product," says Coast Guard Petty Officer Terry Hasenauer. "It was described to us as an oil-like substance, thick and lingering below the surface of the water. Those characteristics can indicate heavy, degraded oil, maybe crude oil or possibly an intermediate fuel oil." Meanwhile, the story spread over the Internet like an oil spill, giving lots of people a queasy feeling. 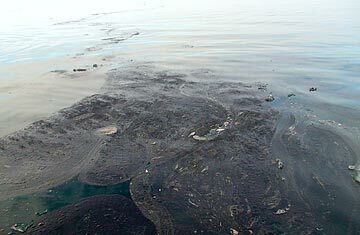 Test results released on July 16 showed that the blob wasn't oil but a plant  a massive bloom of algae. While that may seem less dangerous, people are still uneasy. It's something the mostly Inupiat Eskimo residents along Alaska's northern coast say they cannot remember seeing before. Algal blooms are a common and often menacing event along many U.S. coastlines. Some strains are toxic and can close beaches and poison seafood, posing a hazard to consumers. The National Oceanic and Atmospheric Administration (NOAA) maintains a forecasting system for the Gulf of Mexico to warn of harmful Florida blooms. On Thursday, on the other side of the continent, Senator Olympia Snowe, a Maine Republican, urged the NOAA to direct at least $500,000 to assess a disastrous red tide  a form of algal bloom. "The state of Maine is currently besieged by the most virulent red tide event ever recorded in the region," Snowe wrote. "As a result of this outbreak, virtually the entire coast of our state has been closed to the harvest of clams, mussels, ocean quahogs and other shellfish." While Alaskans may find the algal blob unusual if not frightening, scientists say they are nothing new in Arctic Ocean waters, though the blob itself might be a little weird. Brenda Konar, a marine biology professor at the University of Alaska Fairbanks, says algal outbreaks can and do occur even in icy Arctic waters. It just takes the right combination of nutrients, light and water temperature, she says. "Algae blooms," she says. "It's sort of like a swimming pool that hasn't been cleaned in a while." The blob, Konar says, is a microalgae made up of "billions and billions of individuals." "We've observed large blooms in the past off Barrow, although none of them at all like this," Barry Sherr, an Oregon State University professor of oceanography, said in an e-mail. "The fact that the locals say they've never seen anything like it suggests that it might represent some exotic species which has drifted into the region, perhaps as a result of global change. For the moment, that's just a guess." So far in Alaska, nothing suggests that the Chukchi Sea blob is toxic, though the Coast Guard's Hasenauer says toxicity tests are planned. In any case, virtually no commercial seafood production comes from the waters along Alaska's northern coast, but residents do fish, hunt whales and harvest other animals as part of a traditional subsistence lifestyle. In the meantime, the blob for the most part is staying away from the shoreline and slowly drifting farther away.